PDF of the entire issue (6.39 Mb). Executive Director Mohamed H.A. Hassan: Science has a central role in policy. UNESCO: The world faces a shortfall of 69 million teachers. At a meeting co-hosted by TWAS and IAP, proposals advance on key global challenges. In filmed interviews, board members emphasised dialogue with policymakers and the public. The conversation about science and global challenges expanded to include social media. 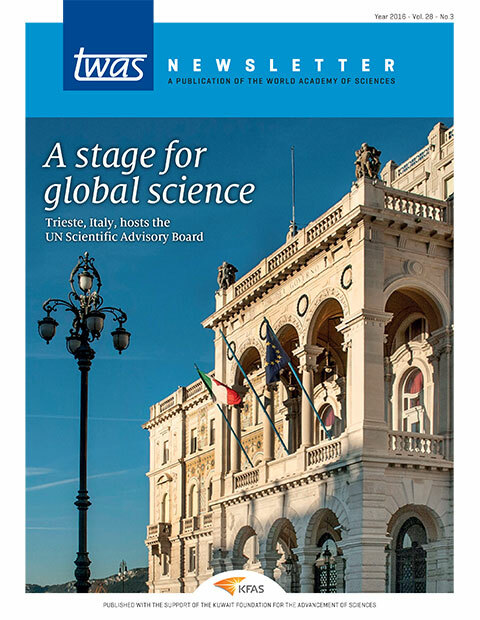 The UN Board’s summary report calls for more science in decisionmaking. Research grant awardees came to Trieste to share stories and insights. TWAS grants are supporting scientists fighting disease in the South. TWAS Fellow Calestous Juma’s book explores how problem-solving technologies stall. The AAAS-TWAS summer course placed participants into a high-stakes simulation. Despite challenges in the Arab region, science provides a path to progress. Why are women so rare in academies? A survey finds that women make up only 12% of membership at 69 science academies. Ethel Nakimuli-Mpungu’s research helps HIV-positive Ugandans manage their depression. Science communicator Liz Neeley knows how to make a message connect.